KPC | What Does KPC Mean? KPC might also be used by an older person "grooming" a youngster online. Maria: My Dad will think it's so cool that we're going to steal a car. Leo: Don't tell him! Remember the rules. KPC! Sam: I'll let myself out of the house once they're all asleep. Ryan: Great. Don't forget, KPC. They'll only spoil my surprise. KPC is an initialism abbreviation. Technically, this means it is pronounced using its individual letters (i.e., Kay Pee Cee), but as this is harder to say than "Keep Parents Clueless," it is not often uttered using its letters. 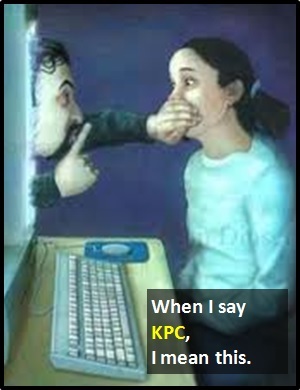 In other words, the abbreviation KPC is for efficiency in writing and not efficiency in speech. Before the digital era, we might have said something like "Don't tell your parents" instead of using KPC.